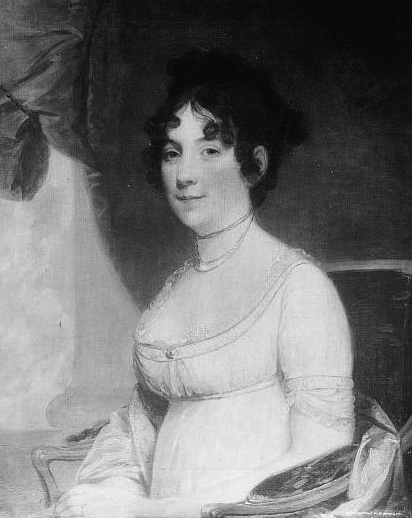 First Lady Dolley Madison (1768-1849), a Philadelphia resident before her marriage to James Madison, had a key role in one of the most storied events of the War of 1812. Just before the enemy’s arrival in August 1814, she ordered the removal of a Gilbert Stuart painting of George Washington from the White House, saving it from almost certain destruction. 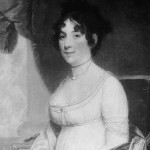 Like the painting of George Washington, this painting of Dolley Madison is the work of Gilbert Stuart (1755-1828), who painted Washington in 1796 and Madison in 1804—a decade before the attack on the White House. The subsequent conflagration of the federal buildings opened the possibility of temporarily returning the capital to Philadelphia, but the House of Representatives defeated a bill including the provision by nine votes. Philadelphia had been the construction and launching site in 1797 of the USS United States, one of the six original capital ships authorized by the Naval Act of 1794. 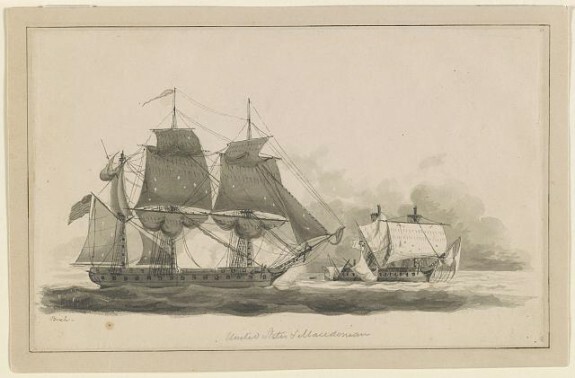 The frigate had tested its mettle during the Quasi-War with France before going into action in the War of 1812. On October 25, 1812, under the command of Commodore Stephen Decatur (1779-1820), the United States achieved a dramatic victory over HMS Macedonian off the coast of Madeira, Portugal. That triumph, as well as other U.S. naval victories, provided badly needed publicity for the administration of James Madison, which was flailing after America’s disastrous attempt to invade Canada that summer. Here, Thomas Birch (1779-1851) has sketched a pen and ink drawing of the battle. The expense of the War of 1812 and damage to commerce dealt the U.S. economy a crippling blow. In 1816, in an effort to overcome the financial problems, the government rechartered the national bank, whose original charter had expired in 1811. 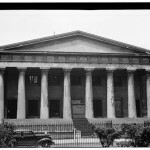 The Second Bank of the United States began operating in Carpenters' Hall on Chestnut Street in 1816. In 1824, it moved into an impressive new Greek Revival structure, also on Chestnut Street, designed by architect William Strickland (1788-1854). 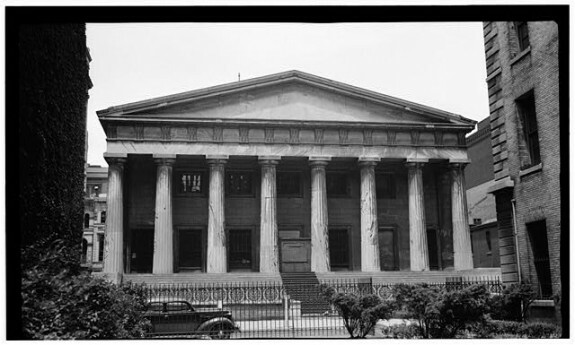 The Second Bank, depicted here in a 1939 photograph for the Historic American Buildings Survey, was federally chartered for only twenty years. However, the building survived and still stands between Fourth and Fifth Streets in center city. The building ceased to function as a bank in 1836 after President Andrew Jackson vetoed Congress’ 1832 rechartering of the bank. In the twenty-first century, the bank building is part of Independence National Historical Park and houses a portrait gallery. Philadelphia was pivotal in supporting America’s war effort during the War of 1812, the final war in which the United States and Britain fought on opposing sides. The city functioned as a major supply center for the army, and its revitalized port outfitted vessels for the navy. People from the Philadelphia area operated war-related businesses, helped build fortifications, and traveled far from home to fight on land and sea. In the aftermath of the conflict, as the country was embroiled in a severe economic downturn, Philadelphia evolved as a focal point for attempting a national economic resurgence as it became the base of operations for the Second Bank of the United States. The War of 1812’s beginning had roots in Philadelphia. It was here, on June 3, 1811, that William Henry Harrison (1773-1841) began his regiment’s march to the Indiana Territory. Several months later, on November 7, 1811, the unit fought the Shawnee at Tippecanoe. Some historians consider this the first battle of the War of 1812, as it made the First Nations tribes realize that an alliance with Britain was their best hope of maintaining self-determination. Pennsylvania’s support for the war was substantial. The state provided the largest vote in Congress for the war’s declaration and later played a key role in reelecting James Madison (1751-1836) in the 1812 presidential race against Dewitt Clinton (1769-1828). The election was a referendum on the war, and a loss for Madison likely would have led to efforts to find an expedient conclusion. In contrast with Pennsylvania, most congressmen from neighboring Delaware and New Jersey had voted against declaring war. Delaware Federalist James A. Bayard (1767-1815) was the minority leader in the Senate, and Federalist opposition was unanimous. (Bayard later became one of five Americans to sign the 1814 Treaty of Ghent, which established peace terms between the United States and Britain.) All of New Jersey’s delegates were Democratic-Republicans like President Madison, yet they, along with other anti-war congressmen, believed the nation was militarily unprepared and that overseas commerce would suffer. Nevertheless, both Delaware and New Jersey acquiesced in raising troops. Philadelphia-area residents from all economic and social backgrounds participated in the war effort. Many who joined militias fought in campaigns in the western territories, Niagara Theater, and Chesapeake region. A large number of the recruits were Irish immigrants who had recently arrived in East Coast cities like Philadelphia and were eager both to oppose the British and find opportunities to lift themselves out of poverty. On the home front, the yard of the Pennsylvania State House (Independence Hall) became an active place for drilling troops and gathering civilians for war-related labor. In 1814, when a British invasion of Philadelphia became a distinct possibility, African American businessmen James Forten (1766-1842) and Russell Parrott (1791-1824) used the yard for organizing more than two thousand free blacks to help strengthen fortifications at Gray’s Ferry on the Schuylkill River. The war saw Philadelphia reclaim its position as an essential port for the United States Navy. Shipyards on the Delaware River busily engaged in shipbuilding and repair. However, not all the region’s maritime industries thrived. The British Navy’s frequent presence on the Delaware Bay adversely affected fishermen and traders. While the British never sailed as far upriver as Philadelphia, the town of Lewes, Delaware, was not so fortunate. On April 5 and 6, 1813, after refusing to provision a British flotilla, Lewes was bombarded for twenty-two hours. Delaware militia defending the town managed to keep British troops from landing on shore, and the attackers eventually withdrew. As the United States continued waging a war that it did not have the adequate finances to afford, it plunged ever deeper into economic chaos. Pennsylvania was unique in that it actually–at least for a while–experienced wartime prosperity. 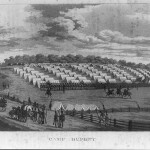 This was largely because the army purchased vast quantities of supplies within the state, and one of the most important supply routes ran between Philadelphia and Pittsburgh. Much of the money generated by these ventures ended up in Pennsylvania banks. Philadelphia found itself with enough money to engage in large-scale building projects. However, business failures in New York in 1814 created a ripple effect that reached Philadelphia and finally brought Pennsylvania’s financial surge to a halt. Many Philadelphia-area entrepreneurs took advantage of wartime opportunities to increase their production and profits. Philadelphia seamstress Elizabeth Claypoole (1752-1836), popularly known as Betsy Ross, was commissioned to make garrison flags for the U.S. arsenal on the Schuylkill River. In Delaware, French immigrant industrialist Éleuthère Irénée du Pont de Nemours (1771-1834) oversaw the manufacture of gunpowder at his mills near Wilmington. His business became crucial after the British naval blockade hindered the importation of gunpowder from Europe. 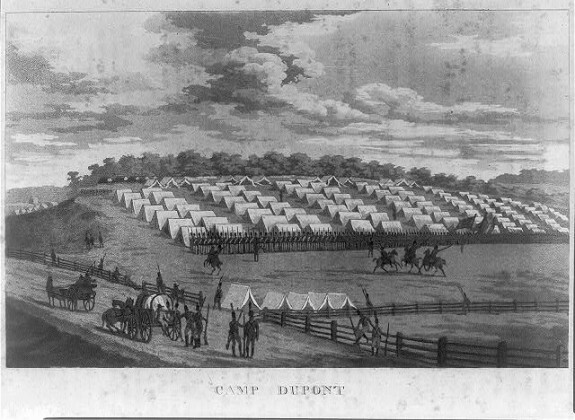 Militia troops were stationed at Camp Du Pont to guard the mills. On August 24, 1814, the British army marched through Washington, D.C., burning both the President’s House (the White House) and Capitol Building. The subsequent conflagration of the federal buildings opened the possibility of temporarily returning the capital to Philadelphia, but the House of Representatives defeated a bill including this provision by nine votes. Despite the disaster at Washington, the war concluded with highly publicized American victories at Lake Champlain (September 11, 1814), Baltimore (September 14, 1814), and New Orleans (January 8, 1815), giving Americans reason to believe that they had won the contest against Britain. This point continues to be debated, but one certainty is that the United States stumbled out of the war in the throes of one of the worst inflationary crises in its history. The expense of the conflict and damage to commerce had dealt the economy a crippling blow from which it would take years to recover. In 1816, in an effort to solve the dilemma, the government rechartered the national bank, which had ceased to exist in 1811, and once again chose Philadelphia as its residence. Later that year, the Second Bank of the United States began operating in Carpenters’ Hall on Chestnut Street. In 1824, it moved into another Chestnut Street home, an impressive new Greek Revival structure designed by architect William Strickland (1788-1854). Philadelphia retained its position as the nation’s financial capital until the early 1830s, when President Andrew Jackson (1767-1845), who gained fame during the War of 1812 for his stunning victory at New Orleans, broke the terms of the bank’s charter. The Greek Revival building, however, became a portrait gallery for Independence National Historical Park in the 1970s and survived into the twenty-first century. In a sense, the building reconnected with its past, for as the War of 1812 led to the creation of the Second Bank of the United States, the building from which the bank operated displays more than thirty portraits of some of the most important figures who participated in that conflict. Dorwart, Jeffrey M., with Jean K. Wolf. The Philadelphia Navy Yard: From the Birth of the U.S. Navy to the Nuclear Age. Philadelphia: University of Pennsylvania Press, 2001. Fanelli, Doris Devine, and Karie Diethorn. History of the Portrait Collection: Independence National Historical Park. Philadelphia: The American Philosophical Society, 2002. Fredriksen, John C. “The Pennsylvania Volunteers in the War of 1812: An Anonymous Journal of Service for the Year 1814.” The Western Pennsylvania Historical Magazine, Vol. 70, No. 2 (1987): 123-57. Golovin, Anne Castrodale, and William Wood Thackara. “William Wood Thackara, Volunteer in the War of 1812.” The Pennsylvania Magazine of History and Biography, Vol. 91, No. 3 (July, 1967): 299-325. Hickey, Donald R. The War of 1812: A Forgotten Conflict. Urbana and Chicago: University of Illinois Press, 1989. Johnson, Leland R. “The Suspense Was Hell: The Senate Vote for the War in 1812.” Indiana Magazine of History, Vol. 65, No. 4 (December, 1969): 247-267. 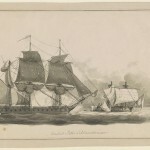 Mahon, John K. The War of 1812. New York: Da Capo Press, Inc., 1991. Malcomson, Robert. A Historical Dictionary of the War of 1812. Landham, Md. : Scarecrow Press, 2006. Miller, Marla R. Betsy Ross and the Making of America. New York: St. Martin’s Griffin, 2010. Tucker, Spencer C., editor. Encyclopedia of the War of 1812: A Political, Social, and Military History. ABC-CLIO, LLC, 2012. Wiggins, Jr., Brigadier General Kennard R. “Delaware Militia in the War of 1812.” Delaware Military History. Winch, Julie. James Forten: A Gentleman of Color. New York: Oxford University Press, 2003. Independence Seaport Museum Archives and Library, 211 S. Christopher Columbus Boulevard, Philadelphia. E.I. du Pont de Nemours & Company Records, 1800-1905, Hagley Museum and Library, 200 Hagley Road, Wilmington, Del. The McAllister Collection, Library Company of Philadelphia, 1314 Locust Street, Philadelphia. Portrait Gallery at the Second Bank of the United States, Independence National Historical Park, 420 Chestnut Street, Philadelphia. War of 1812 Collection, Delaware Historical Society, 505 N. Market Street, Wilmington, Del. Todd House, Fourth and Walnut Streets, Philadelphia. Betsy Ross House, 239 Arch Street, Philadelphia. Cannonball House (Lewes Historical Society Maritime Museum), 110 Shipcarpenter Street, Lewes, Del. Carpenters Hall, 320 Chestnut Street, Philadelphia. Shot Tower Historical Marker, Carpenter and Front Streets, Philadelphia. Stephen Decatur Historical Marker, 600 Block of S. Front Street, Philadelphia. USS United States Historical Marker, 555 S. Columbus Boulevard, Philadelphia. Gilbert Stuart House Historical Marker, Fifth and Chestnut Streets, Philadelphia. James Forten Historical Marker, Fourth and Lombard Streets, Philadelphia. Hi Charles. I found and posted the Find-A-Grave record, and have put pretty much everything I have found on Col Rush in Ancestry.com. Can you direct me to the architecture book you referenced? The property no longer stands, but it sounds like it was substantial. I have see some pictures. Based upon our findings thus far, Col Rush seems to have descended from a father named Conrad Rush who seems to have been German. He lived most of his life on 4th & Race. While multiple branches of our family seem to believe he was related to Benjamin Rush, we have not yet found that evidence.